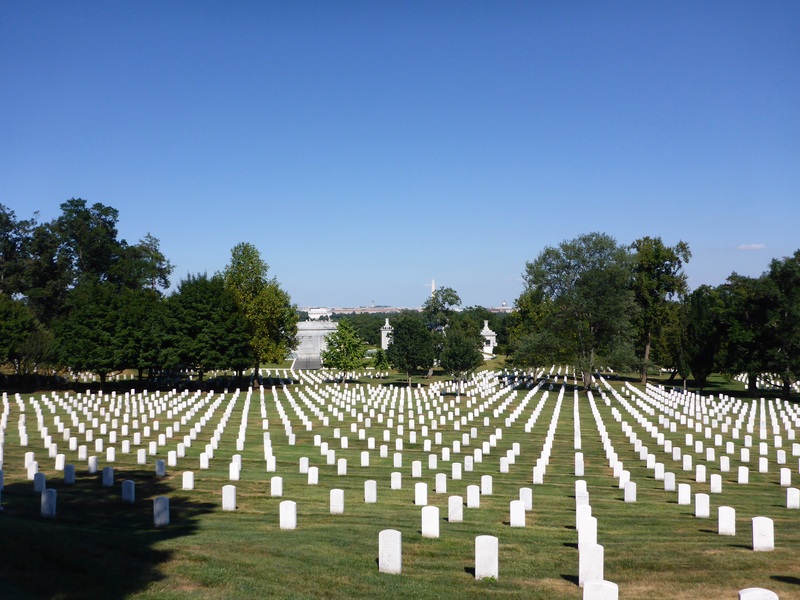 In our previous visits to Washington we have never seen either the Pentagon or Arlington National Cemetery. Our location to the south of the city allowed us the opportunity to see the Pentagon and spend a little time walking through a small part of the cemetery. Seeing some of the dates on the tombstones is a sober reminder of sacrifices that individuals have been made on behalf of their country. It is nice to see that their wives can be buried alongside them, at a later date of course. Currently some 400,000 people are buried there. Washington DC, the nation’s Capital, is home to the United States’ Capitol Building, which houses the legislative arm of the US government. 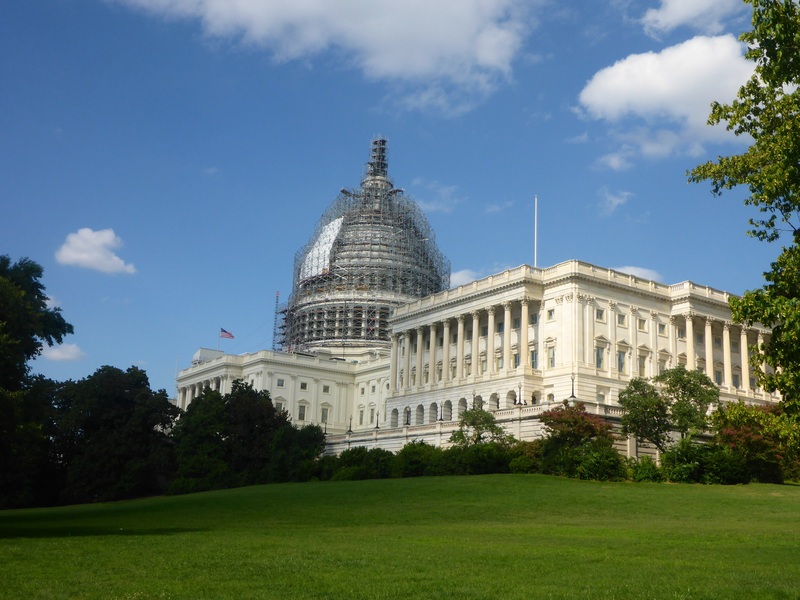 Congress, as it is called, is made up of a Senate and a House of Representatives. We had never been inside the Capitol Building in previous visits, so decided this was time to see the interior and learn a little about how the Congress of the United States works. Anne unfortunately went down with a MSG induced migraine, so only I had the opportunity to visit the Capitol building. Washington DC Capitol showing House of Representatives. The visitor centre is extensive and built underground so as not to spoil the views of the Capitol Building. It is designed to take hundreds of visitors at a time and was much larger than I had imagined. I was able to see both the Senate chamber and House of Representatives chamber from their respective visitors’ galleries plus a tour of the old house of Representatives chamber and its 36 statues. Not bad for an hour and a half. 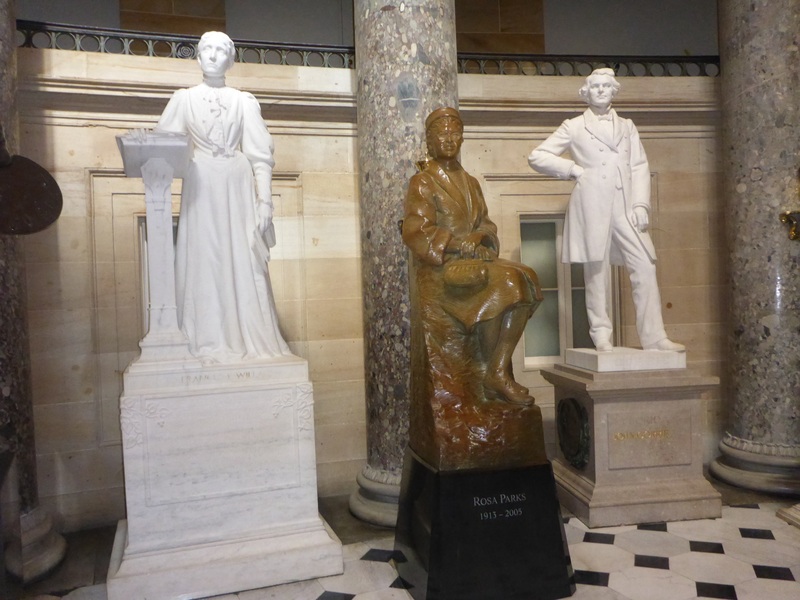 Throughout the Capitol building, one comes across many statues, the largest number reside in the National Statuary Hall which was the old House of Representatives meeting place from 1807 to 1857 – the tour guide said that each of the 50 States can nominate and provide 2 statues, bronze or marble, of famous people (deceased) or, as in the case of the Rosa parks statue, commissioned by Congress, the first by them since 1873. That is just the cover story, one of the other guides said that anyone on a tour left behind overnight gets turned into a statue! Reminds me of C.S. Lewis’s book ‘The Lion, the Witch and the Wardrobe’, where the White Witch turns people and talking animals to stone. A much more plausible explanation than that the States provide the Statues I think, so do not dawdle on the tour. Greek and Roman democracy influenced the founding fathers and this extended to the architecture of the Congress Building but one can see the local influences, such as the top of columns decorated with corn cobs and tobacco leaves. Good to see a local touch. 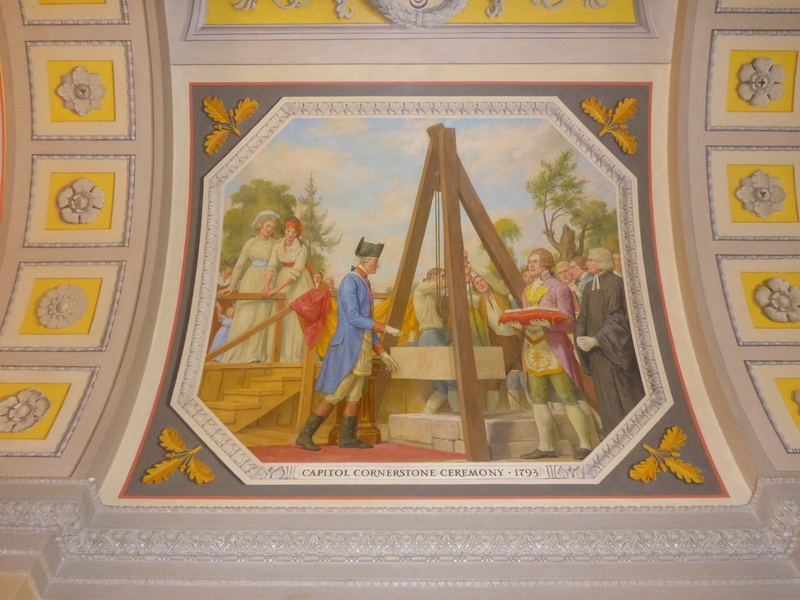 Washington laying the foundation stone for the Capitol building. 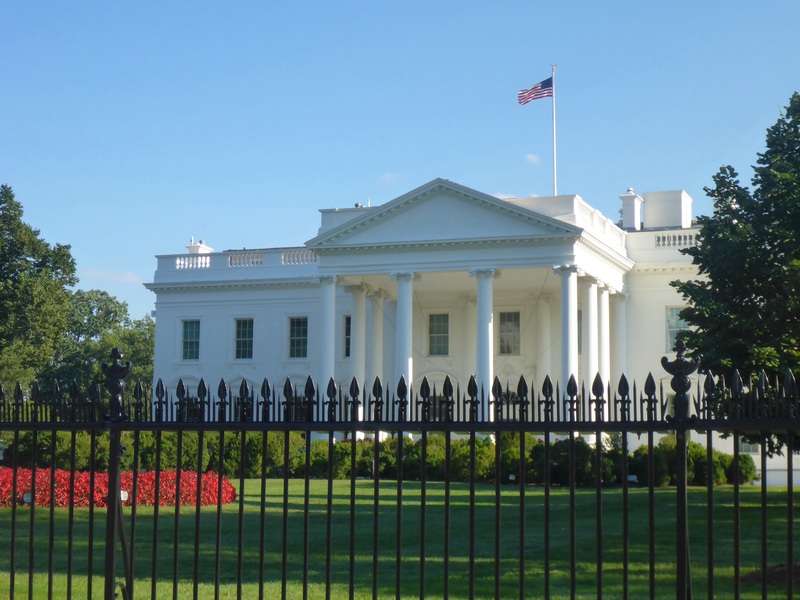 I find Washington is city of contrasts: we have wide avenues, amazing monuments, impressive buildings and poverty. As I walk though the city, I see government officials, military personnel, tourists, every type of law enforcement officer and the homeless and mentally ill. Such a mixture and we have noted that in wealthy areas, such as Santa Barbara in California, we find a higher number of homeless people. We should not forget how lucky we are and have been in life. 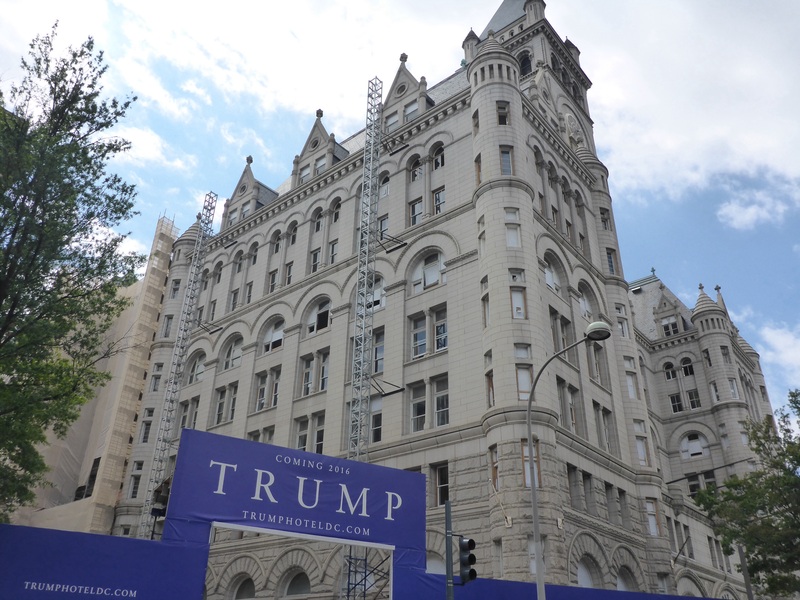 Passing the old post office on Pennsylvania Avenue half way between the Capitol Building and the White House, which is being converted into a hotel, I see a sign: ‘ Trump coming in 2016’. The hotel will be a Trump, or does this foretell the results of the 2016 Presidential Election? I cannot imagine that even Donald Trump planned that one, but we will have wait and see how the Republican Presidential Primaries turn out next year before we know if the poster was more than it was intended to be. 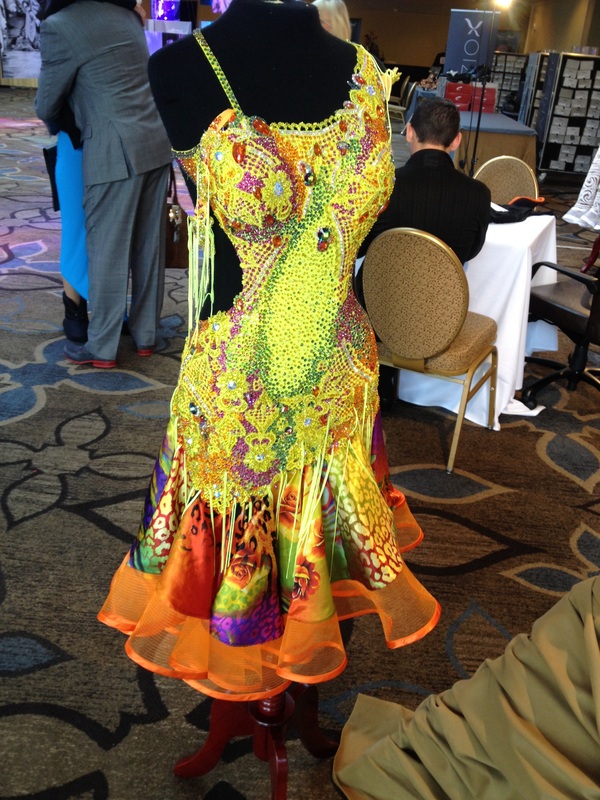 Capital DanceSport Championships were taking place in our hotel. The place was full of colourful dresses and bronzed people taking part in the Ballroom and Latin dancing. The hotel’s arrival information for the participants included warnings not to use the water sprinklers to hang clothing from and to contact housekeeping for old sheets if they were using bronzing sprays in the room! Talking to one of the makeup artists, I learned that she starts at 4 am, as the first dance heats commence at 7am and the competition runs until midnight each day. Anne was back to normal next day. Glad you liked the photos, some of the few I have taken. Msg headache, been in that place! Are you trying out the museums? Seen the Museums on previous trips. Not enough time now. Next time when we get the invite from President Trump. The graves are not for visitors to wander through. There are many paths that one can walk on. The homeless numbers were not huge but I did notice them here and there. Was a little strange, although it has happened a couple of times on the journey.